Carolyn Rickman’s New Book “Tomato and Carrot Adventures” is an Indispensable Introduction to Healthy Eating for Both Children and Adults. 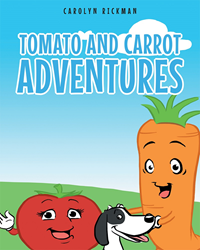 Recent release “Tomato and Carrot Adventures” from Page Publishing author Carolyn Rickman is a creatively crafted and vividly illustrated children’s book that feeds on the reader’s imagination and digests the positives of eating vegetables. Carolyn Rickman, a devoted writer and author, has completed her new book “Tomato and Carrot Adventures”: a fun, captivating story full of animated characters that will be loved by children. Published by New York City-based Page Publishing, Carolyn Rickman’s educational, as well as entertaining, work teaches children the importance of healthy living. A nearby town is having a labor day picnic! Tomato, Carrot and Homer are just arriving near the garden where the children are playing so they can talk to them about the importance of eating all their vegetables and why they are healthy for them. While getting off the bus, Carrot finds himself in a big mess. Join these vegetables and their dog Homer on their newest adventure as they teach children about healthy eating habits! Readers who wish to experience this amusing work can purchase “Tomato and Carrot Adventures” at bookstores everywhere, or online at the Apple iTunes store, Amazon, Google Play or Barnes and Noble.